Construction of SHIP is broken into three phases. Phase 1 is comprised of nearly 1,800 feet of 5 foot ADA approved compressed gravel path from the cul de sac, with observation platforms, benches, interpretive nodes, shoreline access and signage. Construction for this phase began in September 2010, and will be completed by year’s end. Phase 2 is a 1,020 feet 6 foot boardwalk trail that extends the project into the wetlands and further west towards the ferry terminal where it will eventually link with the WSDOT link to the ferry terminal. It will also have shoreline access points, interpretive nodes, bump outs and interpretive signage. 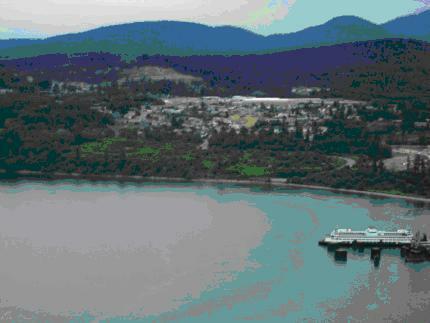 The CIty of Anacortes has budgeted $275,000 in 2011 to complete this phase. Current planning would involve assistance from APF to provide project management and volunteer labor if needed. Phase 3 is an outdoor teaching station and shelter with room for 30 students or visitors. It will have a natural floor, single wall to display materials, and perhaps a station to use educational programs by the SHIP Advisory Committee. Unfortunately this structure cannot be built until the issues with developers at the Edwards Way are satisfied. This would probably be a volunteer phase of the project. Owned by the City of Anacortes, the Parks and Recreation Department, under the capable leadership of Gary Robinson, (also an APF Trustee) has the responsibility for completing the project. While SHIP continues to be monitored by its founder, Anacortes Parks Foundation, it is under the umbrella of the Parks Board, an advisory council for the City Parks and Recreation Department. Because the purpose of the project has to do with education, environmental protection, and public access concerns, a special committee consisting of naturalists, educators and scientists has been appointed to provide guidance on management of SHIP activities and programs. This body is under the capable leadership of Dr. Mark Backlund who has been a loyal and active member of the SHIP program since it began in 1995. Original project plans included a formal trail system from the Washington State Ferry Terminal where ferry riders often visit the wetlands and beachfront. When built, SHIP will attract even more from the ferry terminal to the interpretive trail and beach while awaiting their ferries. While WSDOT originally agreed to construct the trail link on the western terminal with an ADA access trail, it lost its funding and users will continue to use informal trails from the terminal as they have in the past until funds are available. The Mayor of Anacortes and others continue to work with WSDOT to restore funding. Trail planning at the eastern terminal has been problematical because of developer issues. 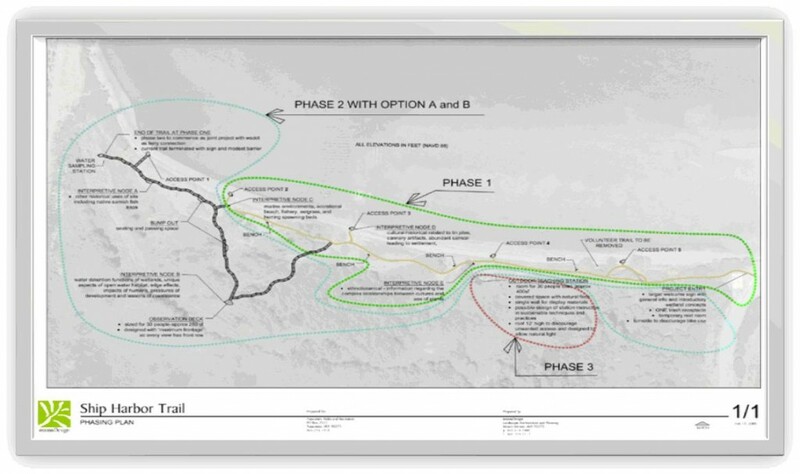 While the City continues to work with developers, SHIP will use temporary trails to access the formal section of the trail. We invite the reader to keep this site on your “favorites” list and watch for developments. Not only do we anticipate the beginning of construction on Phase 1 in early 2010, the City of Anacortes and the APF Board is taking a new look at ways to attract funding to complete Phase 2, and will be looking for help. Many readers will remember the early efforts to create SHIP by many volunteers and financial supporters. Many hours were spent laying the foundation for a project that would benefit an endangered ecosystem, and at the same time provide an outdoor classroom for students and the public to learn about the biota and history of Ship Harbor wetlands and shoreline. Anacortes Parks Foundation has included a short history on the project, believing the public might like to know something about the origin and early planning of SHIP. 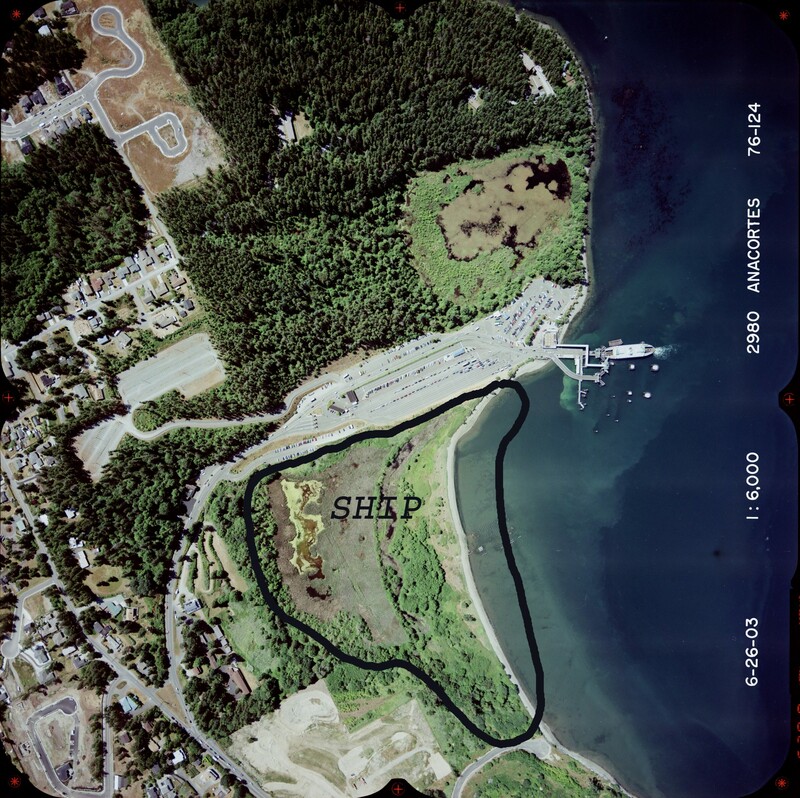 In late 1997, Gale Brink, Commissioner for the Port of Anacortes approached Jim Falk, President of Anacortes Parks Foundation to see if it was interested in developing a wetlands interpretive center at Ship Harbor. The Foundation expressed an interest and formed a Steering Committee led by Jim Falk with Dr. Mark Backlund representing the environmental community and Evergreen Islands, Dr. Steven Sulkin, Director, Shannon Point Marine Center representing the education and scientific disciplines, and Gale Brink representing the public. 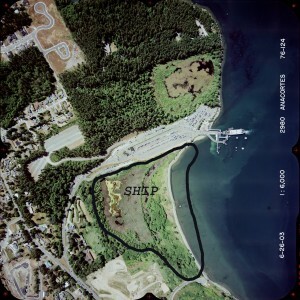 The Ship Harbor Interpretive Preserve (SHIP) was born. The project was accepted and funds were sought from State and other agencies to initially plan the effort. Some 60 volunteers rolled up their sleeves and inventoried animal and plant life, studied hydrology, researched social and economic history, planned a trail system that would best protect the ecosystem, looked for ‘best ways’ to educate local students and the public, and….began a search for funds. Working partners were Shannon Point Marine Center, City of Anacortes, Port of Anacortes, Samish Indian Nation, Washington State Ferry System, Evergreen Islands, Washington State Department of Ecology, Anacortes School District, and most importantly…the general public. The Steering Committee, with some 60 volunteers worked continuously for several years on the functions of trail planning, funding, education, site photography, wild and plant life inventories, and hydrology monitoring projects. Some $76,000 in grants and in-kind donations was raised for brochures, planning, engineering, and other infrastructure needs. Volunteers however, were constantly frustrated with problems of property ownership, developer/permit issues, environmental and other concerns, and it wasn’t until until Gilbane, a qualified developer agreed to purchase the property from the Port of Anacortes and donate the wetlands to the City that real progress was made. Gilbane, a environmentally-friendly developer, also doubled its residential impact obligation to the City with funding to go to SHIP. By this time, Anacortes Parks Foundation had obtained a Shoreline Permit for the project and applauded the transfer of the property to the City of Anacortes allowing SHIP to be developed. The City then assumed the responsibility to carry on the construction of the SHIP interpretive trail system. For hundreds of years, the Samish used Ship Harbor as a fishing site. Later, some of the largest salmon canneries in the world operated there. Salmon canning was important in the history of Anacortes, especially in the period between 1905 and 1917, called “the most prosperous period in the history of the city,” during which time Anacortes was often referred to as “the salmon canning capital of the world.” Ship Harbor was the site of two major canneries. The first cannery on Fidalgo Island was opened at Ship Harbor in 1894 — the Fidalgo Island Packing Company. It would become one of the largest salmon canneries in the world. It later changed its name to Fidalgo Island Canning Company before closing in 1933 and moving to Canada. Two of its well-known labels were “Holly Leaf” brand salmon — “packed fresh on Puget Sound” — and “Wild Rose” brand. Another of the several local canning companies, Anacortes Canning Company, was also located at Ship Harbor. Alaska Packer Association purchased it in 1904 and it closed in 1934. Other industries in Anacortes were an outgrowth of the canneries. By 1911, for example, Anacortes had the largest fertilizer and glue factory west of the Mississippi, which used fish waste. The many cannery buildings at Ship Harbor are all gone now except for some pilings; a few of the buildings stood there, abandoned, until the 1980’s, when they were finally torn down. At one time, the cannery community at Ship Harbor included, in addition to the main cannery buildings and warehouses, bunkhouses and mess halls for workers, an office building, a general store, a blacksmith shop, a carpentry and paint shop, houses, sheds, pig pens, chicken coops, net houses and net racks. All the canneries were dependent on cheap labor, usually supplied by Chinese and Japanese migrant laborers. Over 400 Chinese worked at the canneries at Ship Harbor. In addition to the labor of fish cleaning and processing, for example, each can was made by hand. Workers lived on the site and were discouraged from roaming. Few had families with them; most were bachelors trying to make enough money to return home and marry. Despite the attempt to keep the Asian workers isolated, local culture was enriched. There was a Buddhist temple at 6th and “I” streets in Anacortes. Locals enjoyed Chinese firecracker displays at both Fourth of July and Chinese New Year. “Their vegetables gardens were famous and they supplied the tables of the Chinese cookhouse in abundance.” “…contact with these people was pleasant, their word their bond in business dealings….” However, racism was rampant. There was even an “Anti-Mongolian League,” an early organization for the purpose of “controlling” the Chinese in Anacortes. At Fidalgo Island Packing, there were also local Indians and white women from town who handled some of the fish processing. A 1914 photo shows white women with long skirts, full-length aprons, gloves, and fabric bonnets. “Ten Greeks”stayed at the cannery all year around to mend and tar the fish nets. In 1902, an inventor, E.A. Smith, made a fish-cleaning machine called the “Iron Chink.” Its purpose, Smith said, was “to do away with Chinamen.” Whatever its initial inspiration, the Iron Chink turned out to make the fish processing business more efficient and profitable, taking the place of 15 men on each fish line. It is considered to have been “the greatest technological advancement in the history of the salmon canning industry.” Another technological advance, the vacuum canning method, was developed by Adolf Malmquist of Bellingham in 1913. (an “Iron Chink” is displayed in the museum in Victoria, B.C.) The banner year for the Anacortes canneries was 1913, when 39 million salmon were caught. Anacortes canneries alone did more than $3 million worth of business that year. There were later brief bursts of abundance, but overall, salmon runs permanently dwindled. The canneries and the activities associated with them now are gone from Ship Harbor, and the Ship Harbor wetland has regained much of its natural character and function.